Rogelio V. Solis/SPRepublican Sen. Cindy Hyde-Smith of Mississippi. Sen. Cindy Hyde-Smith, the Mississippi Republican up for reelection in a Tuesday runoff, is once again being criticised for racism. Hyde-Smith, who has been widely criticised for racist comments on the campaign trail, attended an all-white “segregation academy” for high school, sent her daughter to another such academy, and has repeatedly allied herself with Confederate causes. If elected, Hyde-Smith’s opponent, Democrat Mike Espy, would become the state’s first black US senator since Reconstruction. Sen. Cindy Hyde-Smith, the Mississippi Republican up for reelection in a Tuesday runoff, is once again being criticised for racism after news outlets reported that Hyde-Smith attended an all-white “segregation academy” for high school, sent her daughter to another such academy, and has repeatedly allied herself with Confederate causes. This comes amid a race that has for weeks grown increasingly racially charged following remarks Hyde-Smith made about attending a public hanging and making it harder for liberal college students to vote, which many interpreted as racist. Mississippi’s segregationist former governor John Bell Williams reluctantly ordered his state’s schools to integrate in 1969, 15 years after the Supreme Court’s decision in Brown v. Board of Education, which made desegregation the law of the land. Lawrence County Academy – which Hyde-Smith attended – opened in the immediate aftermath of the Brown decision. It was one of many “segregation academies” that opened throughout the state to provide white families with an alternative to sending their children to school with black children, the Jackson Free Press reported on Friday. A Lawrence Academy yearbook obtained by the Free Press includes a photo of Hyde-Smith and her cheerleading squad posing with the school’s mascot – a student dressed as a Confederate general holding a Confederate battle flag. The academy shut down in the late 1980s due to low attendance, but Hyde-Smith sent her daughter, Anna-Michael Smith – who graduated from high school last year – to Brookhaven Academy, a similarly established private school opened in 1970 as a segregation academy. The Free Press reported that in the 2015-2016 year, the school enrolled 386 white students, five Asian students, and just one black student, despite the fact that the city of Brookhaven is 55% black and 43% white. Hyde-Smith, who served as a state senator from 2000 to 2012, also has a history of exhibiting pride in the Confederacy and an apparent willingness to ignore her state’s history of slavery and racial violence and oppression. In her second year as a state senator in 1999, Hyde-Smith sponsored a bill to rename part of a highway after Confederate President Jefferson Davis (the proposal ultimately failed). In 2007, Hyde-Smith authored a resolution praising a Confederate soldier for fighting to “defend his homeland,” CNN reported on Saturday. She worked on the resolution with the Sons of Confederate Veterans, a group that promotes the revisionist historical position that “preservation of liberty and freedom was the motivating factor” in the South’s fight in the Civil War. 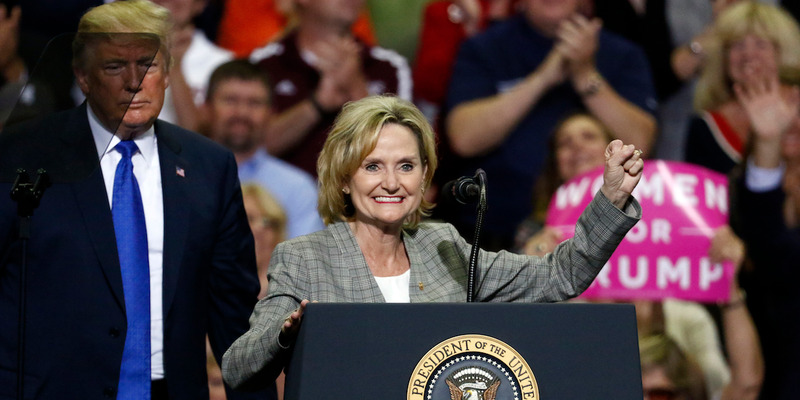 President Donald Trump, whom Hyde-Smith has fully embraced, is scheduled to hold two rallies for the senator on Monday, the eve of the runoff. After facing widespread condemnation for remarking that she would attend a “public hanging” if a supporter asked her to (despite the state’s dark history of lynching), and for suggesting that making it harder for liberal college students to vote would be “a great idea,” Hyde-Smith has defended herself and attempted to stay away from the media. Hyde-Smith’s opponent, Democrat Mike Espy, condemned her comments and called her a “walking stereotype who embarrasses our state,” and during Tuesday’s debate added she had “given our state another black eye.” If elected, Espy would become the state’s first black US senator since Reconstruction – and the first Democrat elected to the chamber from Mississippi since 1982.